There’s nothing like having access to fresh fish. I am a regular at Moby Rick’s Seafood in Saratoga Springs, NY. Rick, a third generation Long Island fisherman, uses sustainable fishing practices and makes sure we have a fresh supply of fish and shellfish. I stopped in on Friday and picked up this beautiful tuna. Mark LOVES tuna and these tuna steaks were absolutely gorgeous. 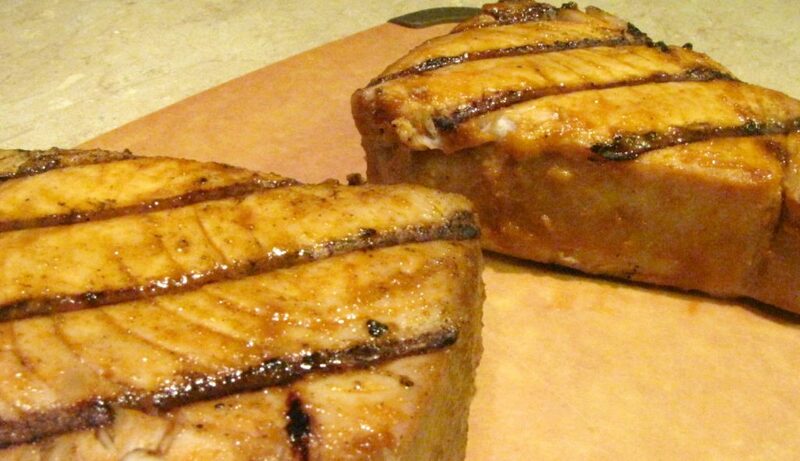 Our favorite way to cook tuna steaks is to marinate for 15-20 minutes and then sear on each side. The full recipe is at the bottom of the post. Set 1/3 of the marinade aside. With the other 2/3 brush both sides of the tuna steaks and let sit for 15-20 minutes. On a screaming hot oiled grill (at least 400F), grill the steaks 2-3 minutes on each side. Let the steaks rest for about 5 minutes. Slice and serve. 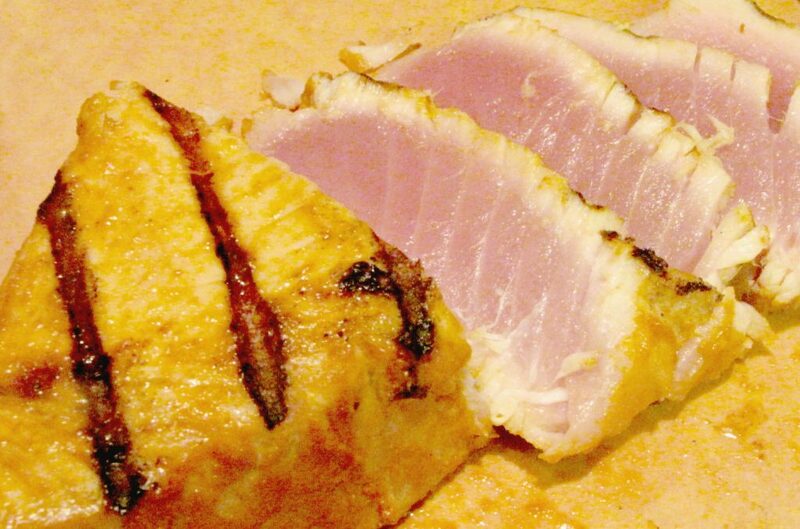 It might seem intimidating to make tuna at home but it really isn’t hard to do. Once you try it, you’ll be surprised at how easy it is. If you’re not sure or have a question, email me or leave your question in the comments below. 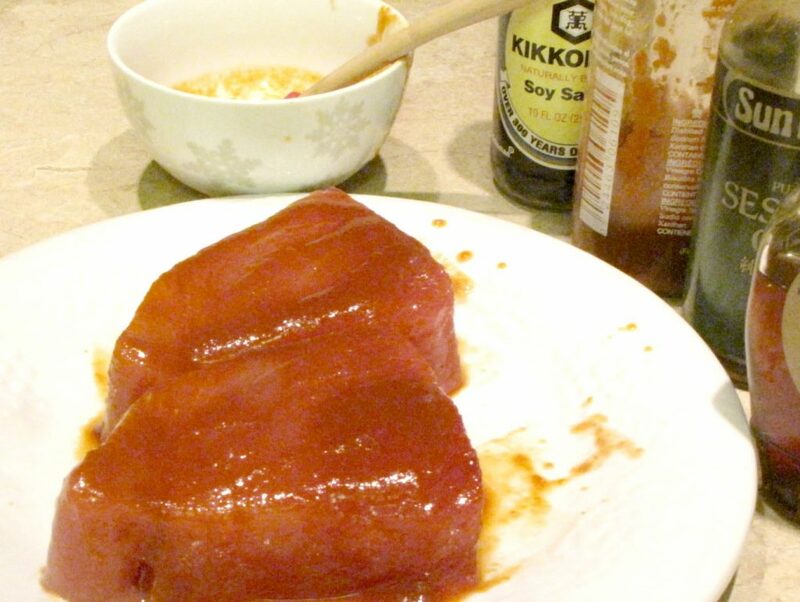 Soy and sriracha marinated tuna steaks for two. Preheat a grill to 400F. Combine soy sauce, sriracha, sesame oil and maple syrup. Set ⅓ aside. With the other ⅔, brush both sides of the tuna steaks. Let the steaks sit for 15-20 minutes. Brush the grill grates with an oiled paper towel. Place the steaks on the grill, close the lid and grill each side for 2-3 minutes. If the grill is hot enough and the steaks are seared enough, they will flip easily. Remove the steaks and let rest for about 5 minutes. 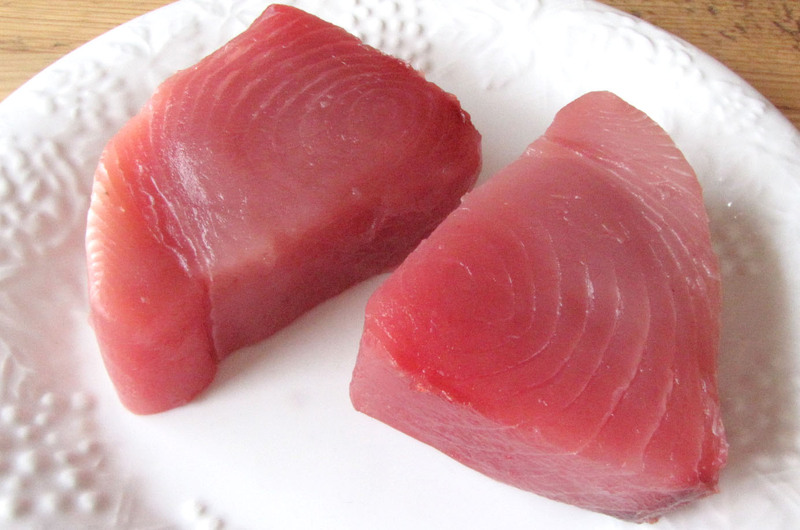 I haven’t made tuna steaks in a while and now you are making me crave it! Looks great!